80th Battalion became the 1st Pioneers with 1st Division; became the 9th Battalion Canadian Railway Troops. 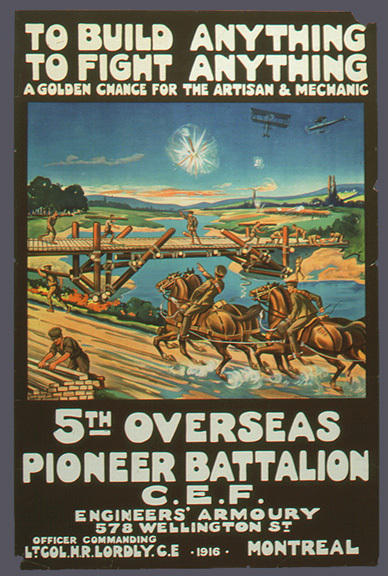 2nd Pioneers first mobilized October 28th 1915 at Guelph Ontario. Companies previously recruited as follows: "A" Company 1st Div area, mobilized at London. "B" and "C" Companies 2nd Div area and 3rd Div., Toronto, Ottawa, and Sault St. Marie. "D" Company 2nd Div., Northern Ontario, Sudbury, Cobalt, Porcupine. Trained in Quebec; went to England Dec 1915; first saw action in March 1916 with 2nd Division. Broken up to join Engineers. 48th Battalion became the 3rd Pioneers with 3rd Division; first saw action in March 1916. - broken up to reinforce 7th and 29th Infantry Battalions. 5th Pioneers - recruited in Montreal. Broken up to join Engineers. 107th (Winnipeg) became the 107th Pioneers. Broken up to join Engineers. 123rd (Royal Grenadiers, Toronto) became the 123rd Pioneers. Broken up to join Engineers. 124th (Governor General's Body Guard, Toronto) became the 124th Pioneers. Broken up to join Engineers. Pioneer battalions differed from normal infantry in that they would be composed of a mixture of men who were experienced with picks and shovels (i.e. miners, road men, etc) and some who had skilled trades (e.g. smiths, carpenters, joiners, bricklayers, masons, tinsmiths, engine drivers and fitters). A Pioneer battalion would also carry a range of technical stores that infantry would not. This type of British battalion came into being with an Army Order in December 1914. A Canadian view: There is a difference between a Pioneer battalion and a Labour Battalion. Pioneers were Infantry, and only received recruits of A1 category. They provided a necessary function different than that of the standard Infantry Battalion. 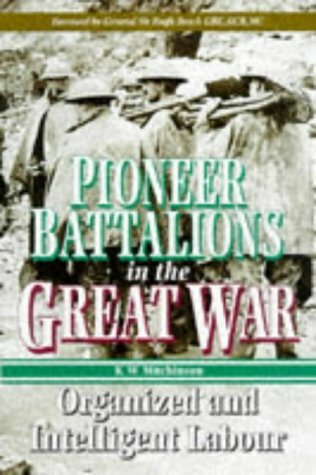 In the British Army the Pioneers received special training, received the pick of skilled (men with applicable trades) Infantry, and received extra pay. Canada had four labour Battalions in its Corps structure in France; these weren't pioneers. The Pioneers’ function was within the Division. They provided the extra man power to the Engineer Field Companies and skilled pioneer functions to the Infantry in the front line. In fact in the 1918 reorganization of the engineers the Pioneers were absorbed into the Divisional Engineer Brigades. It was the pioneers that built the dug outs, built the roads in forward areas, laid barbed wire entanglements, and were the power house in trench construction. Pioneers also were the ones who followed on the heels of the Infantry in the attack to fill trenches and build passable avenues for the guns to be brought forward.